“Pride (In the Name of Love” was the first single released from the album “The Unforgettable Fire.” The release was widely released worldwide, and came with a number of promotional releases. In some countries the commercial release of “Pride (In the Name of Love)” was also used for promotion, and are stamped and marked in some way. This was done in Italy, where the sleeve of the 7-inch is pressed so it says “Campione Gratuito”, and Spain where a stamp was used on the cover of the 7-inch to mark it as promotional. In Canada a gold stamp was used on the 12-inch single when it was used for promotion. In most cases the promotional releases are unique and different in some way from the commercial releases. 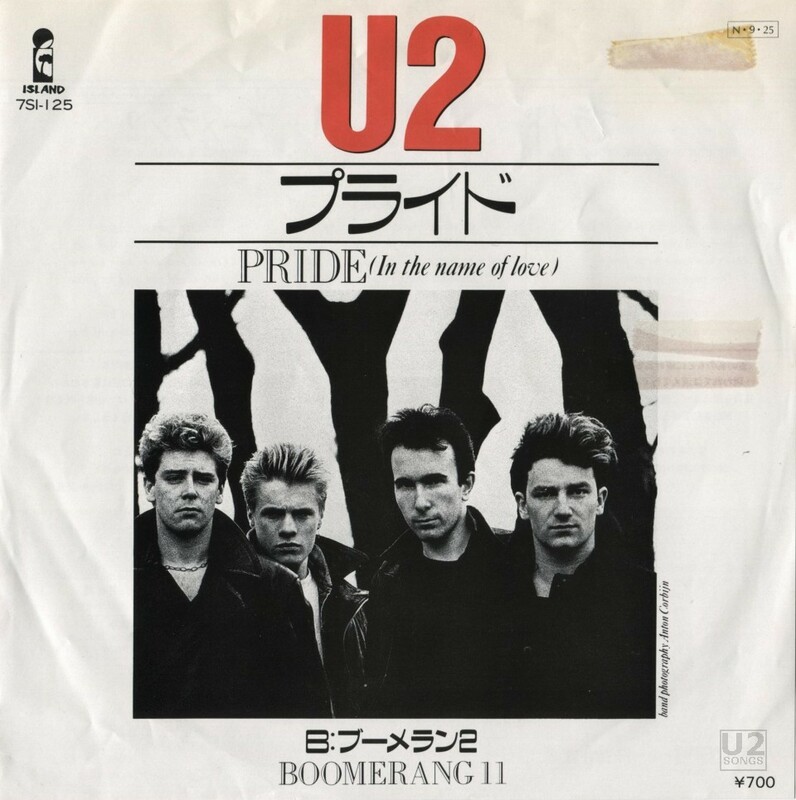 Many of the 7-inch promotional singles contained “Pride (In the Name of Love)” and “Boomerang II” like the commercial single. In Japan the 7-inch was released in the same packaging as the commercial single, however the vinyl itself had a different label. The commercial version had the colourful tree label, where the promotional single had the same tree image, but it is done in shades of blue on white. In Peru and Spain, the promotional 7-inch singles would contain the same tracks as the commercial single but would have a different label on the vinyl. There are two different promotional labels known for Peru. There is one promotional release in Spain with a different label, as well as the previous mentioned copies of the commercial release. In the UK the juke box pressing of the single also contained the same tracks, and was released with the same label as the commercial single but with a bigger hole in the center of the vinyl. In Mexico a 7-inch promotional single came with a press sheet, and contained “Pride (In the Name of Love)” on both sides of the single. This was the case in the USA as well where the promotional singles came in a generic sleeve from the label. These were released with two different reference numbers in the USA, some ending with SP on the label, and some with AR on the label. A small number of singles in the USA were packaged in the commercial cover. There were some promotional 12-inch pressings done for “Pride (In the Name of Love)” including Japan, where the single was packaged the same as the commercial release, however with a white label with only blue print, instead of the colorful label found on the commercial release. In the USA the 12-inch promotional release was released in a generic sleeve, and only contained the title track on both sides. In Italy a 7-inch pressing of the single was done for juke boxes and was released with a unique sleeve featuring the lyrics of the song. This was backed with “Via Con Me” by Edoardo De Crescenzo. More information about these Italian juke box singles can be found under the specific discography entry for these singles. Likewise in Brazil, a 12-inch pressing of the single came with four songs in total, but none by U2. Further information on these Brazil 12-inch pressings can be found in a separate discography entry. In Australia Festival Records was the company being used to produce Island records releases. In the late 80s they were tasked with producing a small number of copies of “All I Want is You” in 7-inch purple vinyl for a local radio contest. It was a legitimate short run done for the radio contest, said to be limited to only 100 copies. They had also produced a 7-inch red vinyl copy of “Desire” (1500 copies) and a 7-inch blue vinyl copy of “Angel of Harlem” (1500 copies). However, a number of “after hours” pressings done at the pressing plant resulted in additional coloured vinyl in very limited numbers. One legitimate pressing that was done, was a limited pressing of “Pride (in the Name of Love)” in clear vinyl. Five copies were made in clear vinyl and were awarded to people in the management of Festival Records. These were very limited, and never released for sale, and as such are listed here among promotional items. An article in Record Collector Magazine in 2006, listing the top 60 U2 collectibles, placed the clear vinyl issue of “Pride (In the Name of Love)” at the #2 spot in the list. For more information on the single “Pride (in the Name of Love)”, including information about the song, how it charted, and the songs included on international releases, please see our discography entry for the “Pride (in the Name of Love)” single.